In the Hindu tradition, Ganesha is the Remover (or Supplier) of Obstacles and has many genesis stories. The predominant story is that his father, Shiva, beheaded him when he came between Shiva and his wife, Parvati, and replaced his human head with one of an elephant variety. 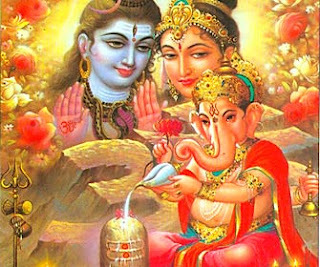 In the midst of a conversation about our parents, my wise friend Rebecca pointed out, "Ganesha's dad cut his head off and replaced it with an elephant's head, but no where in the scriptures do you hear Ganesha complaining about his dad. This is what separates humans from gods." The arrogance and staunch idealism of youth demand that our parents be perfect. On a practical level, this makes sense. When we're small, soft and vulnerable, we need our parents to be perfect. We rely on them for absolutely everything for many years of critical development. If they are unable to perform their duties for us, we may not survive. It's life and death. A person can go a long long time thinking about themselves in a particular way and be mistaken. Sometimes the thoughts we think about ourselves are mean ones having to do with intelligence, body image, ability or worthiness. Other times the self-deception is harder to overcome because the thoughts are nice ones having to do with virtues possessed. For instance, I've spent the last 28 years thinking that I am a very open minded, judgement-free individual, and in many cases I am. When it comes to strangers in the world at large I'm extremely supportive. Everyone should be able to live their life in the best way they can, in the way that will inspire the greatest joy and the least amount of harm. The path of life is winding and I have all kinds of patience for people finding their own way in their own time. Your pain is a very ordinary thing. The details that make it up are unique to you, but the pain itself is so very common. Everyone has experienced some variety of trauma or loss and many people carry it around clutched tightly to their chests like a badge of honor. It is as if what we feel will be invalidated by acknowledging how typical it is to feel that way, so we wrap ourselves up in the feeling, in the old story, and guard our experience. It's only when we pick our stories apart that we begin to see the connections between wounded hearts. My story and pain our mine, but they look an awful lot like so many stories I've heard and so much pain I've witnessed. I won't ever be able to fully understand what it was like for you to experience what you have, but know that I have suffered too, that I am also the walking wounded trying to heal.